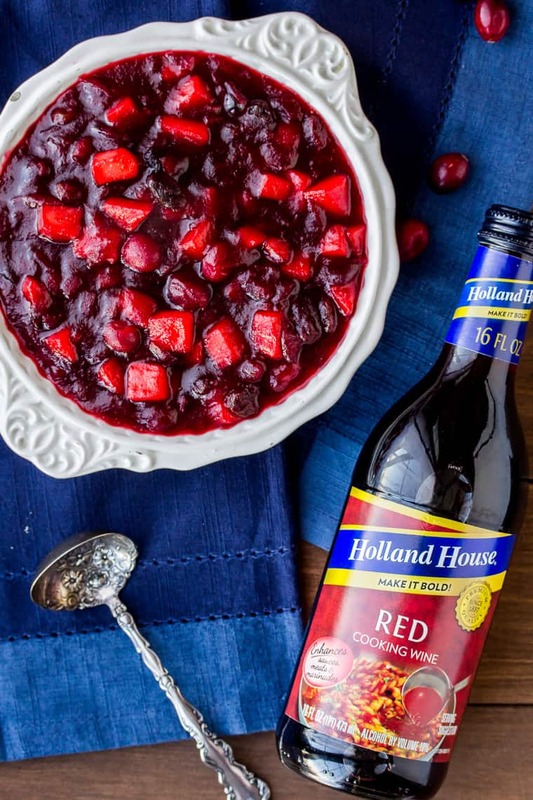 This post is sponsored by Holland House Cooking Wine. All content and opinions are entirely my own. Pork Tenderloin with Cranberry Apple Chutney is a surprisingly simple recipe. Juicy pork tenderloin is topped with a tart, yet sweet, Cranberry Apple Chutney. It’s an easy, yet elegant meal that’s perfect for the holiday season. The holiday season can be so hectic. Finding time to fit every thing in, while still being able to sit back and enjoy time with loved ones, can be challenging! This year, we booked a couple holiday-related weekend trips well ahead of time. That way they can’t get pushed off to the next year…again. Between these planned trips and my oldest son’s travel soccer schedule, our free time together to just sit back and relax at home is very limited. But, this is a special time of the year. And to bring a feel of the holidays to even just our everyday routine at home is something that I really enjoy. Besides the decorations, the best way I know how to do that is with food. 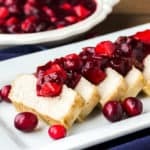 Pork Tenderloin with Cranberry Apple Chutney is an easy recipe to start with! The beautiful dish can be made any night of the week, yet also be the star during holidays or when entertaining. The best part? It’s on the table in under an hour! Now, you might be asking yourself, what exactly is a chutney? Basically, a chutney is a combination of sweet and savory ingredients cooked down into a chunkier sauce. In this case, the Cranberry Apple Chutney, is somewhat similar to a Cranberry Sauce. However, the addition of ingredients like onion and raisins, plus the use of cooking wine, technically makes it a chutney. 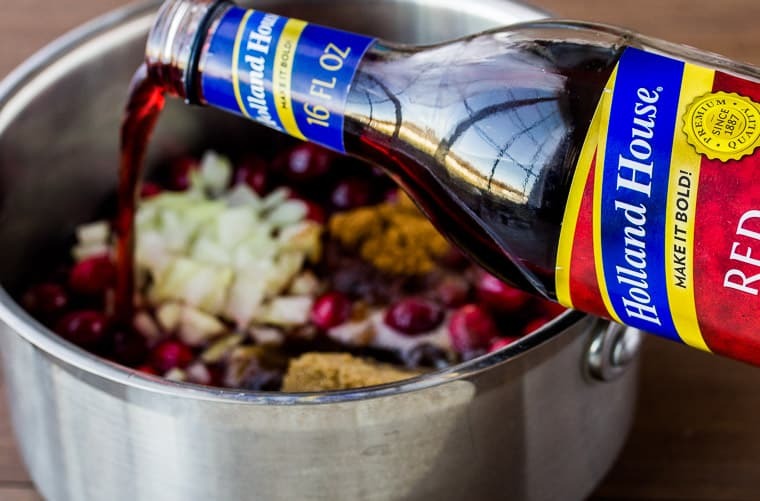 For this recipe, I use Holland House Red Cooking Wine to really amp up the flavor of the chutney. 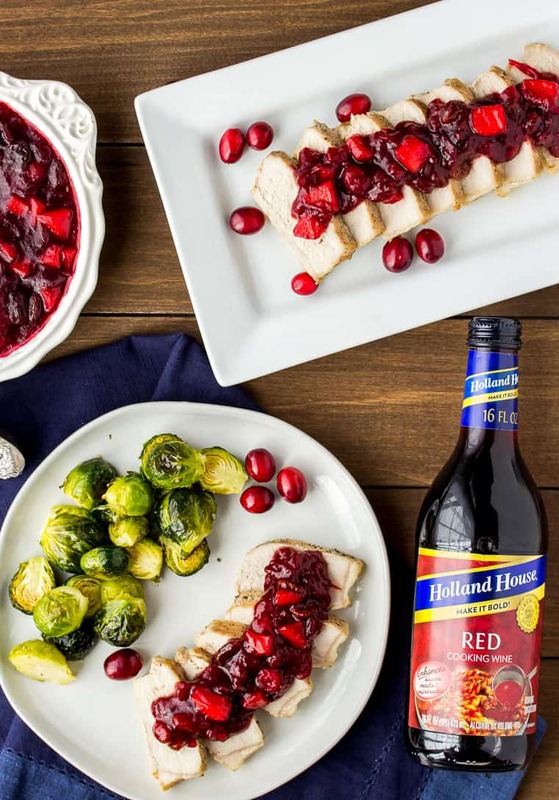 I mentioned that in this recipe for Pork Tenderloin with Cranberry Apple Chutney, I use Holland House Red Cooking Wine. The reason I opted to use red cooking wine is because of the smooth, medium-bodied wine flavor. Just adding a generous splash of this cooking wine to the chutney added even more depth of flavor to the dish overall. The Red Cooking Wine variety is also ideal for beef and lamb dishes, as well as heartier soups, stews, and chilis. But, Holland House Cooking Wines are actually available in five varieties – Marsala, Sherry, White, Red, and White with Lemon. Each one provides a simple way to add a big boost of bold flavor to all your favorite winter and holiday meals! 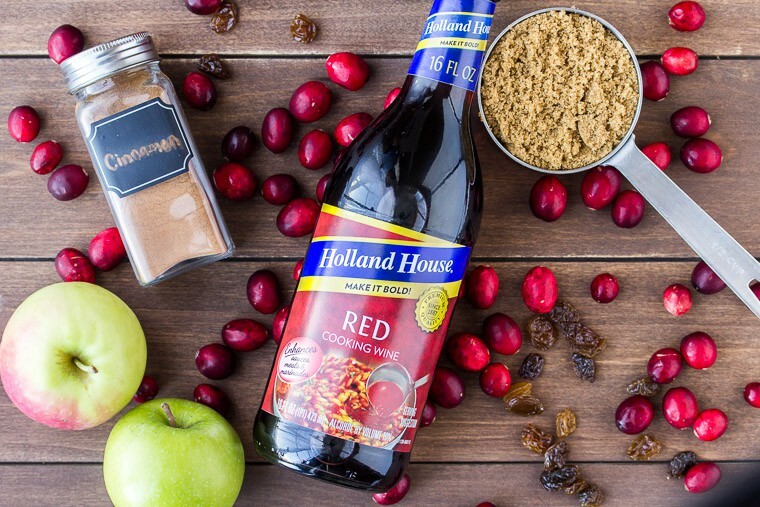 You can find some quick tips and tasty recipes on Holland House’s labels and their new website. plus be sure to follow them on Facebook and Pinterest for more delicious recipes and tips! Visit the Holland House website to download a redeemable coupon for your next grocery store visit. Dice the onion and apples. Pat the pork dry with a paper towel and season with salt and pepper. Cover with aluminum foil and roast for 20-25 minutes. Remove the foil and continue roasting for 5-10 minutes, or until the internal temperature of the pork reaches 145°F. Remove the pork from the oven, tent with foil, and allow to rest for 5 minutes before slicing. 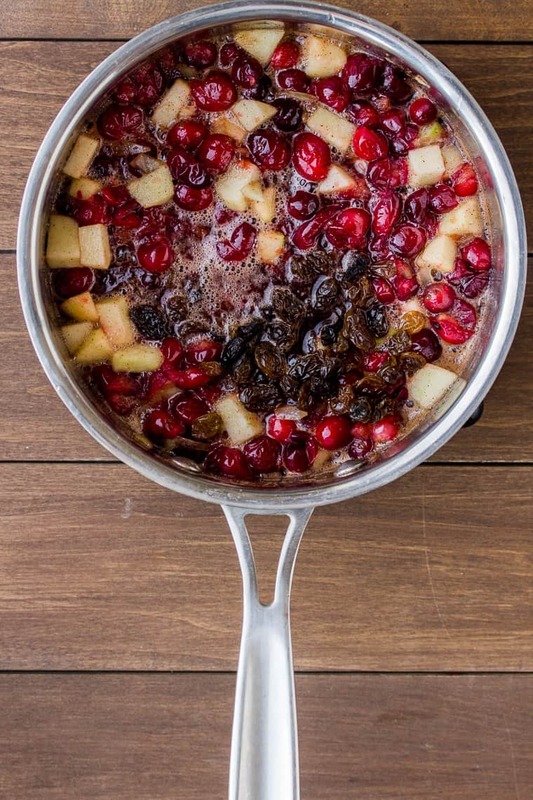 While the pork is roasting, make the Cranberry Apple Chutney. Bring the water and granulated sugar to a boil in a saucepan over medium heat. 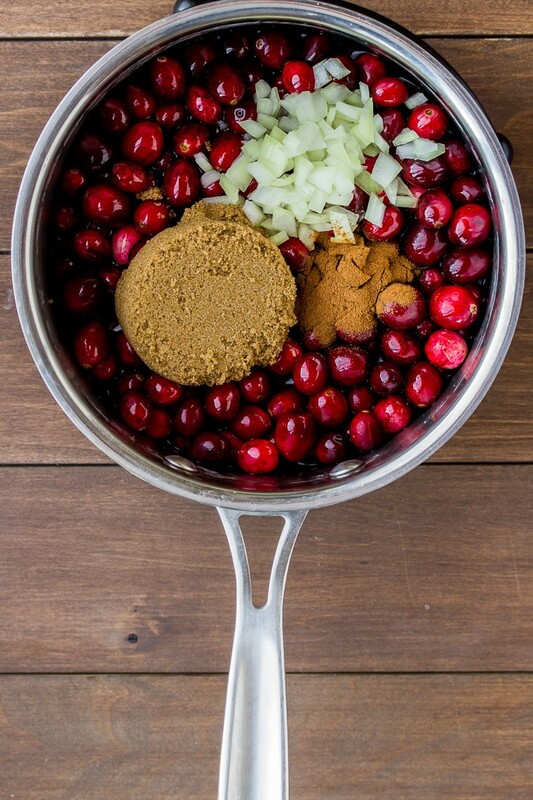 Add the cranberries, onion, brown sugar, and cinnamon. Pour in the Holland House Red Cooking Wine. Continue cooking, stirring occasionally, until the cranberries begin to pop, about 5 minutes. Lower the heat and stir in the apples and raisins. Simmer until the sauce thickens about 10-15 minutes. Slice the pork tenderloin and spoon the Cranberry Apple Chutney over the top. Alternatively, you can place the Cranberry Apple Chutney in a serving bowl and allow everyone to spoon it over their pork themselves. You can use other cuts of pork for this recipe, just be aware that the cook time will vary. This recipe is also delicious over turkey! The Cranberry Apple Chutney can be made ahead of time and served chilled or be re-heated gently over low heat before serving. Cranberry Apple Chutney can also be used as a stand-alone side dish, served over ice cream, mixed into oatmeal, and so much more! Any leftover Pork Tenderloin with Cranberry Chutney should be stored separately. 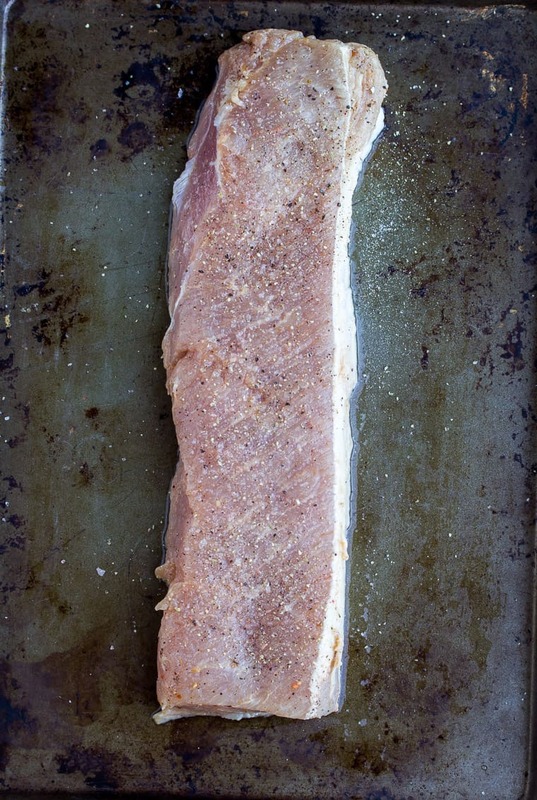 Store leftover pork tenderloin in an air-tight container in the refrigerator. Use within 3-4 days. Store any leftover Cranberry Apple Chutney in an air-tight container in the refrigerator for up to 10 days. It can also be kept in freezer bags in the freezer for up to 2 months. To use frozen Cranberry Apple Chutney. allow it to thaw in the refrigerator, then serve chilled or gently reheat it in a saucepan over low heat. 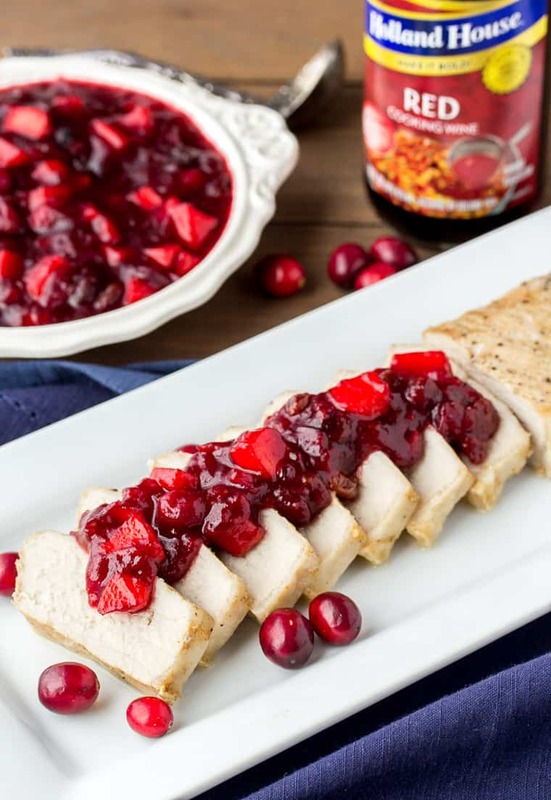 Love this recipe for Pork Tenderloin with Cranberry Apple Chutney? Follow us on Pinterest, Instagram, and Facebook for more! Juicy pork tenderloin is topped with a tart, yet sweet, Cranberry Apple Chutney. Add in the cranberries, onion, brown sugar, cinnamon, and Holland House Red Cooking Wine. Lower the heat and stir in the apples and raisins. Simmer until the sauce thickens about 10-15 minutes. 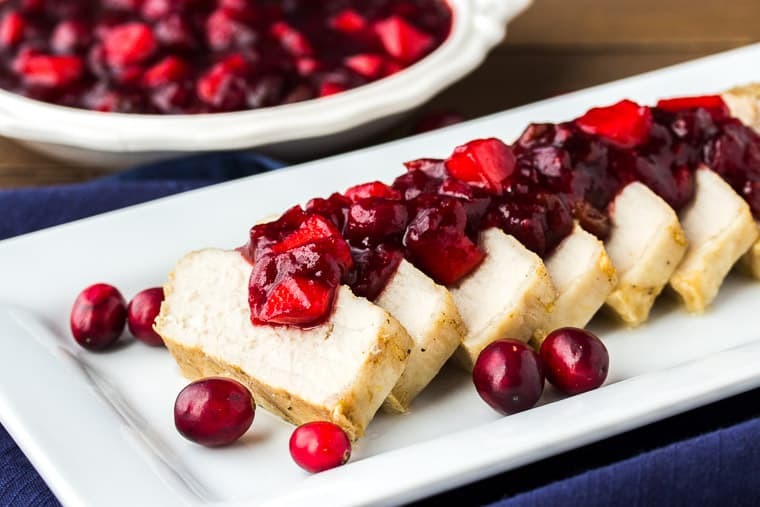 Serve the pork tenderloin, sliced and topped with the Cranberry Apple Chutney. ** Nutritional Information includes all of the Cranberry Apple Chutney. Most likely, you will have plenty left over, so please take that into account. This is a sponsored post written by me on behalf of Holland House. All content and opinions are entirely my own.